Zinc guttering for two roof edges of e.g. your summer house or log cabin. Check the detailed overview here to find out the specific contents of each set. Our zinc guttering is easy to install and doesn't require soldering! Select below an all-in-one zinc gutter kit by clicking on the correct image (top view from gabled roof). This kit contains guttering for both edges. In case the length of your roof exceeds 13,60 m, purchase one complete kit and add one (or more) extension kit(s). Select below the material / quality by clicking on the correct image. The stated effective roof area advice represents the number of m2 for the drainable roof edge. You can quickly calculate the effective roof area of this side yourself by multiplying the roof's width (A) by length (B). 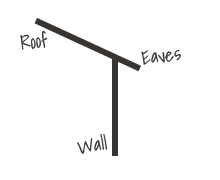 how to quickly calculate the effective roof area yourself. Step 4: Need a set of top rafter brackets? No fascia board present (under the eaves). You can fix the fascia brackets on or under the eaves with a set of top rafter brackets. There is a fascia board present, but this slopes towards the wall. With a set of top rafter brackets you can fix fascia brackets on the eaves. Add one set of galvanised top rafter brackets if no vertical fascia board or weatherboard is present. All top rafter brackets fit with each fascia bracket in the set.